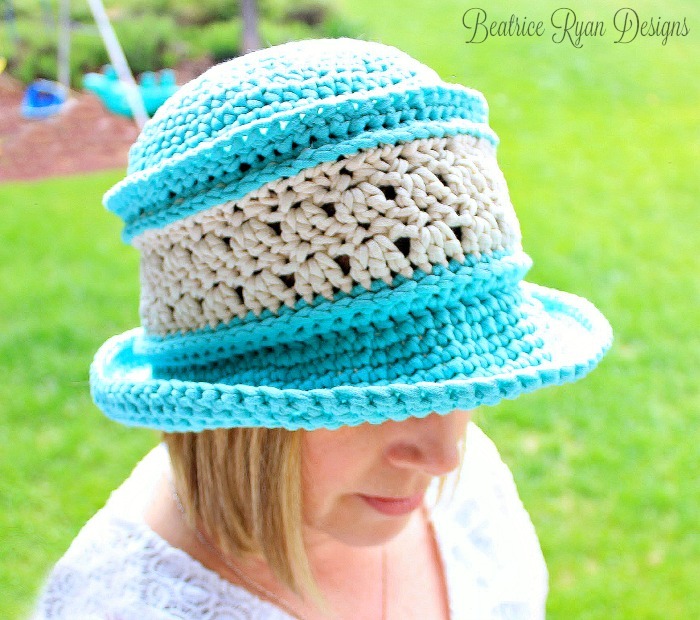 Amazing Grace Blissful Summer Hat… Free Crochet Pattern! If you love this hat pattern… Favorite it on Ravelry… Click Here!! The Amazing Grace Blissful Summer Hat is the 17th Free Pattern in the Amazing Grace Series… To learn more about this series, click on the Amazing Grace Free Patterns tab at the top of the site. 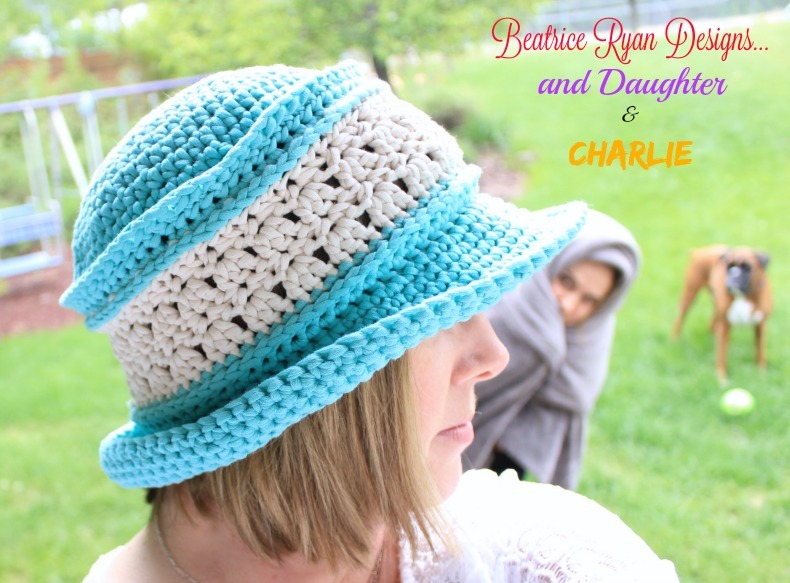 You may recognize portions of this fun and stylish pattern,,, Last year I designed the Amazing Grace Blissful Beanie and Amazing Grace Blissful Slouchy… This fun summer hat has many of the same elements, just an awesome bulky cotton yarn and a brim!! Bernet Maker Home Dec yarn in Aqua and Cream were used in this hat. This is a fabulous yarn that I highly recommend. Row 14: Ch 1 Turn, Sc in 1st St, Ch 2, Sc in same St as beginning Sc, Sk 2 Sts, *(Sc,Ch2,Sc) all in next St, Skip next 2 St* Repeat * * Around. Join to beginning Sc. = 25 Ch 2 spaces. Row 15: DO Not Turn, Sl St in 1st Ch 2 Sp, Ch 3(Counts as Dc now and throughout), 2 more Dc in same Ch 2 Sp., *3 Dc in next Ch 2 Sp(Shell made)*, Repeat * * Around, Join to top of beginning ch 3 . =25 Shells made. For the remainder of the hat you will not turn at the beginning of each row. Row 31: Ch 1, Sc in each St around. Join to beginning. = 84 Sc. Lightly shape your hat by slightly stretching the inside crown of the hat and the brim. Congratulations!! You now have an Amazing Grace Blissful Summer Hat!! Here is one of my favorite photobombs ever… I was in the back yard trying to get a picture… It was fairly cold and sprinkling a bit… My daughter was out with me all wrapped up in her favorite blanket and of course… Charlie made sure to be in the photo as usual! When we saw this picture we laughed until we almost cried… Good times! I’m loving your pattern. I have several skeins of this yarn so I decided to try it. So far it’s looking fantadtic! I can’t wait to finish it. I hope Bernat comes out with some more solids in this line. It’s soooo soft. Great!!! I hope it turns out perfect! What kind of material is the yarn? been working on this hat in super bulky and almost ran out just for the top portion. Frogged it. and went with a red heart yarn 2 strands held together, for a substitute bulky yarn… still too big… switching to another super bulky for the “cream part” of the hat. .. can i reduce it by decreasing stitches?… i dont know what to do.help is appreciated. Please and thank you… AND i forgot to add, using a k 6.5 hook… or should i go down a hook or 2?